The 2nd-seeded ’47-’48 Toronto Maple Leafs had the slight edge in opportunities in the series, but thanks to their play in net, the 31st-seeded ’06-’07 Nashville Predators were able to pull off this upset. For TRONNA, the offense just wasn’t good enough. Only two players scored more than once for the Leafs, Bill Ezinicki and Harry Watson, both scored just twice. Only six other players scored during the series. Top line center Syl Apps led the Maple Leafs in assists with four while his linemate Howie Meeker was second with three. Apps and Meeker both totaled four points to lead the team in overall scoring while Ezinicki and Watson were tied with defenseman Jimmy Thomson for second with three points each. 12 total players registered a point, so there was balance for Toronto. Goaltender Turk Broda had his moments, but he was outshined by his Predators counterpart. He finished with a 1-4-0 record to go along with a 3.60 goals against average and a .907 save percentage. For a long time, Nashville’s offense has been about getting production from everyone to make up for true offensive stars. That was no different here as over 10 different Predators scored during the series. Paul Kariya and David Legwand led the way with four goals each while Jason Arnott and Martin Erat were tied for second with two goals apiece. The third member of the Legwand and Kariya line, Steve Sullivan ended the series with six assists to lead Nashville while defenseman Kimmo Timonen was second with four. Both Kariya and Legwand tallied three helpers to finish right behind Timonen. All three of that top line, Kariya, Legwand and Sullivan, finished tied for the team lead in overall scoring with seven points. Timonen was alone in second with five points with Jason Arnott alone in third with four points. 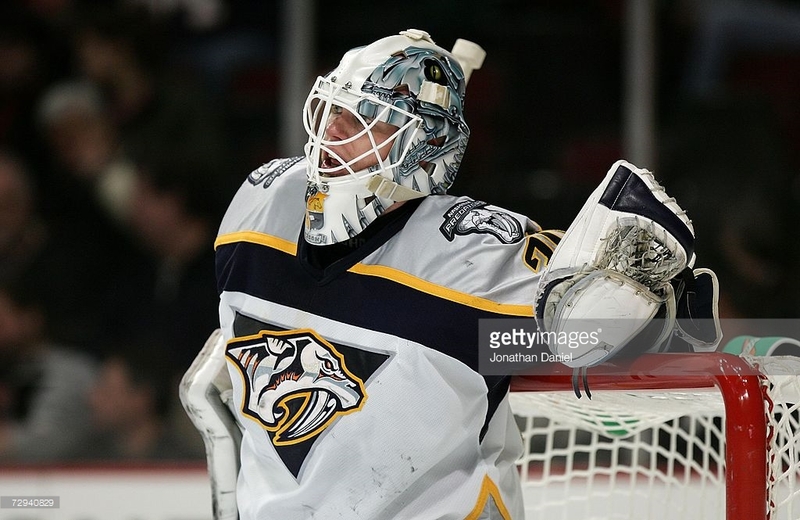 Chris Mason was stellar in net for Nashville and averaged almost 40 saves per game. He finished with a 4-1-0 record to go along with a 2.00 goals against average and a very impressive .950 save percentage. The ’06-’07 Predators are in their second straight UNP and have just passed how fair they went last year. They match the franchise mark of reaching the Third Round of the UNP where they will face either the 15th seeded ’95-’96 Colorado Avalanche or the 18th-seeded ’14-’15 Tampa Bay Lightning. The ’47-’48 Maple Leafs are the third different team to represent the city at the center of the hockey world. They are the third Maple Leaf team to now go out in their opening matchup as Toronto continues to look for their first UNP series victory. Up next in the Second Round, the 4th-seeded ’70-’71 Boston Bruins face the 29th-seeded ’11-’12 Phoenix Coyotes! This entry was posted in 2nd Round, Ultimate NHL Playoff and tagged Bill Ezinicki, Chris Mason, David Legwand, Harry Watson, Howie Meeker, Jason Arnott, Jimmy Thomson, Kimmo Timonen, Martin Erat, Nashville Predators, Paul Kariya, Shea Weber, Steve Sullivan, Syl Apps, Toronto Maple Leafs, Turk Broda, Ultimate NHL Playoff. Bookmark the permalink.